Mubychem Group, established in 1976, is the pioneer manufacturer of Carbon Activated, Activated Charcoal Carbon, Pharmaceutical, Fragrance & Flavor chemicals in India. Mubychem Group has several manufacturing facilities spread across Gujarat and Mumbai India and world wide contacts and toll manufacturers. We are exporting globally to countries like USA, Europe, UAE, South Africa, Tanzania, Kenya, Egypt, Nigeria, Uganda, Turkey, Mexico, Brazil, Chile, Argentina, Dubai, Indonesia etc. Obtained from vegetable matter by suitable carbonization processes intended to confer a high adsorption power. Black, light powder free from grittiness. Practically insoluble in all usual solvents. A. When heated to redness it burns slowly without a flame. To 2.0 g in a conical flask with a ground-glass neck add 50 ml of dilute hydrochloric acid. Boil gently under a reflux condenser for 1 h, filter and wash the filter with dilute hydrochloric acid. Evaporate the combined filtrate and washings to dryness on a water-bath, dissolve the residue in 0.1 M hydrochloric acid and dilute to 50.0 ml with the same acid. To 2.0 g add 40 ml of water and boil for 5 min. Cool, restore to the original mass with carbon dioxide-free water and filter. Reject the first 20 ml of the filtrate. To 10 ml of the filtrate add 0.25 ml of bromothymol blue solution and 0.25 ml of 0.02 M sodium hydroxide. The solution is blue. Not more than 0.75 ml of 0.02 M hydrochloric acid is required to change the colour of the indicator to yellow. To 1.0 g add 25 ml of dilute nitric acid and boil for 5 min. Filter whilst hot through a sintered glass filter and wash with 10 ml of hot water. Evaporate the combined filtrate and washings to dryness on a water-bath, add to the residue 1 ml of hydrochloric acid, evaporate to dryness again and dry the residue to constant mass at 100-105 °C. The residue weighs a maximum of 30 mg.
To 0.25 g add 10 ml of dilute sodium hydroxide solution and boil for 1 min. Cool, filter and dilute the filtrate to 10 ml with water. The solution is not more intensely coloured than reference solution. To 2.0 g add 50 ml of ethanol (96 per cent) and boil under a reflux condenser for 10 min. Filter immediately, cool, and dilute to 50 ml with ethanol (96 per cent). The filtrate is not more intensely coloured than reference solution. Evaporate 40 ml of the filtrate to dryness and dry to constant mass at 100-105 °C. The residue weighs a maximum of 8 mg. In an intermittent-extraction apparatus, treat 10.0 g with 100 ml of cyclo-hexane for 2 h. Collect the liquid and dilute to 100 ml with cyclo-hexane. Examine in ultraviolet light at 365 nm. The fluorescence of the solution is not more intense than that of a solution of 83 μg of quinine in 1000 ml of 0.005 M sulphuric acid examined under the same conditions. To 1.0 g in a conical flask add 5 ml of hydrochloric acid and 20 ml of water. Heat to boiling. The fumes released do not turn lead acetate paper brown. Maximum 15 per cent, determined on 1.00 g by drying in an oven at 120 °C for 4 h.
Maximum 5.0 per cent, determined on 1.0 g.
To 0.300 g in a 100 ml ground-glass-stoppered conical flask add 25.0 ml of a freshly prepared solution of 0.5 g of phenazone in 50 ml of water. Shake thoroughly for 15 min. Filter and reject the first 5 ml of filtrate. To 10.0 ml of the filtrate add 1.0 g of potassium bromide and 20 ml of dilute hydrochloric acid. Using 0.1 ml of methyl red solution as indicator, titrate with 0.0167 M potassium bromate until the red colour is discharged. Titrate slowly (1 drop every 15 s) towards the end of the titration. Carry out a blank titration using 10.0 ml of the phenazone solution. Minimum 40 g of phenazone is adsorbed per 100 g of activated charcoal, calculated with reference to the dried substance. Total viable aerobic count (2.6.12) not more than 103 micro-organisms per gram, determined by plate count. 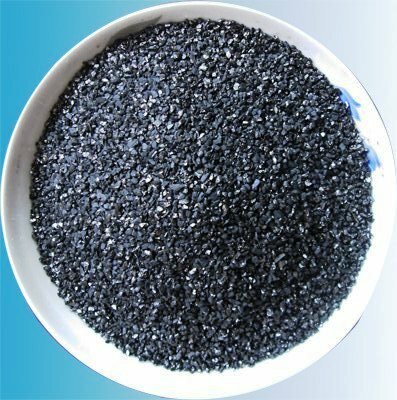 Carbon, Activated ( Also called Activated Carbon or Activated Charcoal ), occurs as a black substance, varying in particle size from coarse granules to a fine powder. It is a solid, porous, carbonaceous material prepared by carbonizing and activating organic substances. The raw materials, which include sawdust, peat, lignite, coal, cellulose residues, coconut shells, and petroleum coke, may be carbonized and activated at a high temperature with or without the addition of inorganic salts in a stream of activating gases such as steam or carbon dioxide. Alternatively, carbonaceous matter may be treated with a chemical activating agent such as phosphoric acid or zinc chloride, and the mixture carbonized at an elevated temperature, followed by removal of the chemical activating agent by water washing. Activated Carbon ( Activated Charcoal) is insoluble in water and in organic solvents. Function: Decolorizing agent; taste- and odor-removing agent; purification agent in food processing. A. Place about 3 g of powdered sample in a glass-stoppered Erlenmeyer flask containing 10 mL of dilute hydrochloric acid (5%), boil for 30 s, and cool to room temperature. Add 100 mL of iodine TS, stopper, and shake vigorously for 30 s. Filter through Whatman No. 2 filter paper, or equivalent, discarding the first portion of filtrate. Compare 50 mL of the subsequent filtrate with a reference solution prepared by diluting 10 mL of iodine TS to 50 mL with water, but not treated with carbon. The color of the carbon-treated iodine solution is no darker than that of the reference solution, indicating the adsorptivity of the sample B. Ignite a portion of the sample in air. Carbon monoxide and carbon dioxide are produced, and an ash remains. Higher Aromatic Hydrocarbons: Passes test. Iodine Number: Not less than 400. Water Extractable: Not more than 4.0%. The following additional Requirements should conform to the representations of the vendor: Loss on Drying and Residue on Ignition. ASTM, 100 Barr Harbor Drive, West Conshohocken, PA 19428. Activated Charcoal is the residue from the destructive distillation of various organic materials, treated to increase its adsorptive power. Microbial limits— It meets the requirements of the tests for absence of Salmonella species and Escherichia coli. Reaction— Boil 3.0 g with 60 mL of water for 5 minutes, allow to cool, restore the original volume by the addition of water, and filter: the filtrate is colorless and is neutral to litmus. Loss on drying— Dry it at 120 for 4 hours: it loses not more than 15.0% of its weight. Residue on ignition: not more than 4.0%, a 0.50-g test specimen being used. Acid-soluble substances— Boil 1.0 g with a mixture of 20 mL of water and 5 mL of hydrochloric acid for 5 minutes, filter into a tarred porcelain crucible, and wash the residue with 10 mL of hot water, adding the washing to the filtrate. To the combined filtrate and washing add 1 mL of sulfuric acid, evaporate to dryness, and ignite to constant weight: the residue weighs not more than 35 mg (3.5%). Chloride— A 10-mL portion of the filtrate obtained in the test for Reaction shows no more chloride than is contained in 1.5 mL of 0.020 N hydrochloric acid (0.2%). Sulfate— A 10-mL portion of the filtrate obtained in the test for Reaction shows no more sulfate than is contained in 1.0 mL of 0.020 N sulfuric acid (0.2%). Sulfide— Place 0.50 g in a small conical flask, add 20 mL of water and 5 mL of hydrochloric acid, and boil gently: the escaping vapors do not darken paper moistened with lead acetate TS. Cyanogen compounds— Place a mixture of 5 g of Activated Charcoal, 50 mL of water, and 2 g of tartaric acid in a distilling flask connected to a condenser provided with a tightly fitting adapter, the end of which dips below the surface of a mixture of 2 mL of 1 N sodium hydroxide and 10 mL of water, contained in a small flask surrounded by ice. Heat the mixture in the distilling flask to boiling, and distill about 25 mL. Dilute the distillate with water to 50 mL, and mix. To 25 mL of the diluted distillate add 12 drops of ferrous sulfate TS, heat the mixture almost to boiling, cool, and add 1 mL of hydrochloric acid: no blue color is produced. Heavy metals— Boil 1.0 g with a mixture of 20 mL of 3 N hydrochloric acid and 5 mL of bromine TS for 5 minutes, filter, and wash the charcoal and the filter with 50 mL of boiling water. Evaporate the filtrate and washing to dryness, and to the residue add 1 mL of 1 N hydrochloric acid, 20 mL of water, and 5 mL of sulfurous acid. Boil the solution until all of the sulfur dioxide is expelled, filter if necessary, and dilute with water to 50 mL. To 20 mL of the solution add water to make 25 mL: the limit is 0.005%. Un-carbonized constituents— Boil 0.25 g with 10 mL of 1 N sodium hydroxide for 5 seconds, and filter: the filtrate is colorless. Alkaloids— Shake 1 g of Activated Charcoal, previously dried at 120 for 4 hours, with a solution of 100 mg of strychnine sulfate in 50 mL of water for 5 minutes, and filter through a dry filter, rejecting the first 10 mL of the filtrate. To a 10-mL portion of the subsequent filtrate add 1 drop of hydrochloric acid and 5 drops of mercuric-potassium iodide TS: no turbidity is produced. Dyes— Pipette 50 mL of methylene blue solution (1 in 1000) into each of two glass-stoppered, 100-mL flasks. Add to one flask 250 mg, accurately weighed, of Activated Charcoal, insert the stopper in the flask, and shake for 5 minutes. Filter the contents of each flask through a dry filter, rejecting the first 20 mL of each filtrate. Pipette 25-mL portions of the remaining filtrates into two 250-mL volumetric flasks. Add to each flask 50 mL of sodium acetate solution (1 in 10), mix, and add from a burette 35.0 mL of 0.1 N iodine VS, swirling the mixture during the addition. Insert the stoppers in the flasks, and allow them to stand for 50 minutes, shaking them vigorously at 10-minute intervals. Dilute each mixture with water to volume, mix, allow to stand for 10 minutes, and filter through dry filters, rejecting the first 30 mL of each filtrate. Titrate the excess iodine in a 100-mL aliquot of each subsequent filtrate with 0.1 N sodium thiosulfate VS, adding 3 mL of starch TS as the endpoint is approached. Calculate the number of mL of 0.1 N iodine consumed in each titration: the difference between the two volumes is not less than 0.7 mL.